Did Theon’s torture under the hands of Ramsay Snow, reduction to Reek, and eventual rescue of Sansa make up for his betrayal of Rob? And who didn’t want Asha (Yara) Greyjoy to be named the next Queen of the Iron Islands? Now that they’ve aligned themselves with Danaerys and her army, what will be next for the Greyjoys? The cake: I made this cake to portray the bitterness and saltiness of the Ironborn. 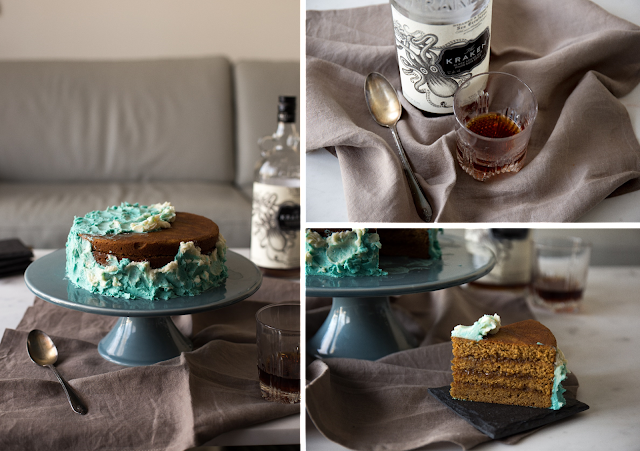 Rum always reminds me of sailors and pirates, so I made a dark molasses rum cake as the base. 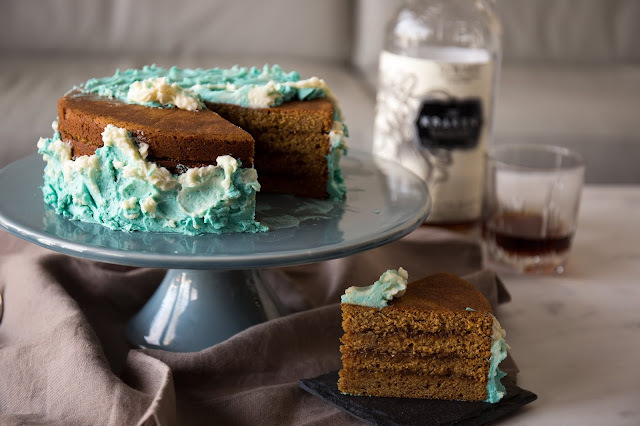 The inside is layered with molasses rum caramel, and the outside was frosted with boiled milk frosting and sprinkled with sea salt to imitate the foam from the waves that crash against the Isle of Pyke. Most of it remains unfrosted, because the people of Pyke, like the island itself, are hard and unadorned. Grease two 8” round cake pans with shortening or butter and line bottom with parchment paper, lightly greasing paper as well (see my foolproof method here). In a large bowl with an electric mixer or stand mixer, cream together butter with brown and white sugars until fluffy, about 5 minutes. Add eggs one at a time, mixing and scraping down the sides with a rubber spatula after each addition until well-combined. Add molasses and mix to combine. 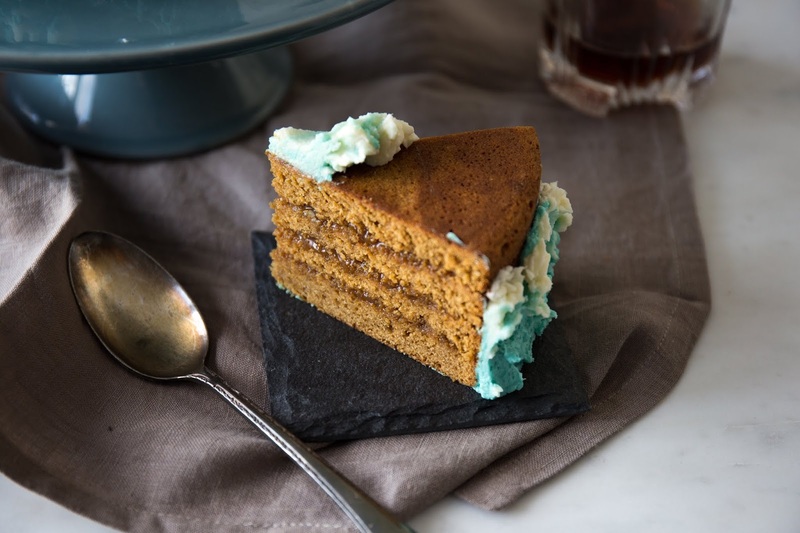 In a small bowl, whisk together flour, baking powder, salt, nutmeg, and espresso powder (if using). In a large liquid measuring cup, combine milk rum and vanilla. Starting and ending with the flour mixture, alternate adding flour and milk into butter-sugar mixture (3 additions flour mixture, 2 additions milk mixture) and mixing just until combined. Pour evenly into prepared pans (I use a kitchen scale to make sure) and bake in the centre of the preheated oven until a cake tester or toothpick inserted into centre of the cake comes out clean, about 25-30 minutes. Let cool in pans on a rack for 10 minutes, then invert onto racks and let cool completely. In a medium pot, melt the sugar until it becomes a deep amber color. For me this is usually as soon as it melt completely and has no lumps remaining. Add the butter and molasses and stir until melted. Pour in the heavy cream (the mixture will spatter) and whisk until smooth. If there are still lumps, stir over low heat until they melt. Remove from heat, stir in salt and let cool completely. Make a day ahead and store in fridge overnight until ready to use. Whisk the milk and flour together in a small saucepan. Bring to a boil over medium heat, stirring constantly. Boil for 1 minute, then remove from the heat. Transfer the mixture to a small heatproof bowl and press a sheet of plastic wrap directly on the surface to prevent a skin from forming. Let the milk mixture sit for 15 minutes at room temperature. Refrigerate until cooled completely, about 1 hour. The mixture should thicken to a pudding consistency. Place the butter and sugar in a stand mixer fitted with the paddle attachment. (Alternatively, use an electric hand mixer and large bowl.) Beat on medium-high speed until lightened and fluffy, about 5 minutes. Stop the mixer and scrape down the sides of the bowl with a rubber spatula. Add the cooled milk mixture. Return to medium-high speed and beat until well combined, about 3 minutes. With the mixer running, add the vanilla and salt and beat for 1 minute more. 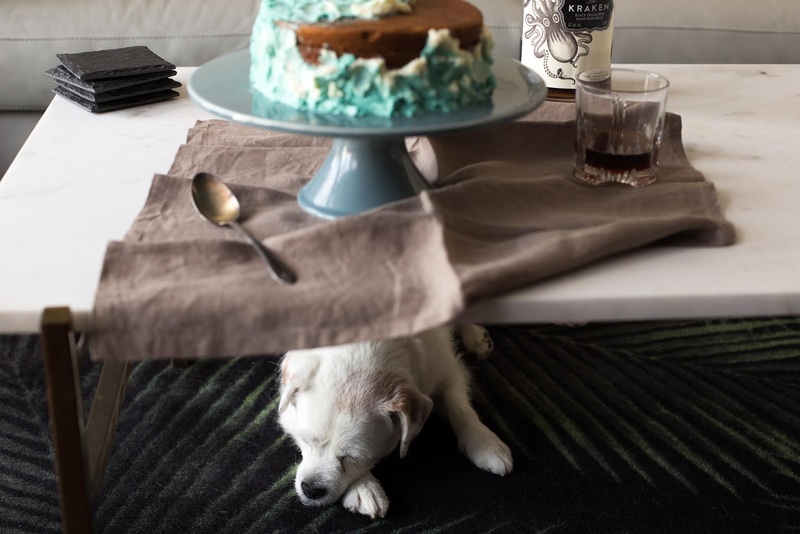 Cut each cake horizontally into two layers to make four layers total. Spoon about 1/4 to 1/3 of the cooled caramel onto a layer and spread evenly. Top with next layer and repeat. Finish so that the bottom (smooth) layer of one of the cakes is facing upwards on top. 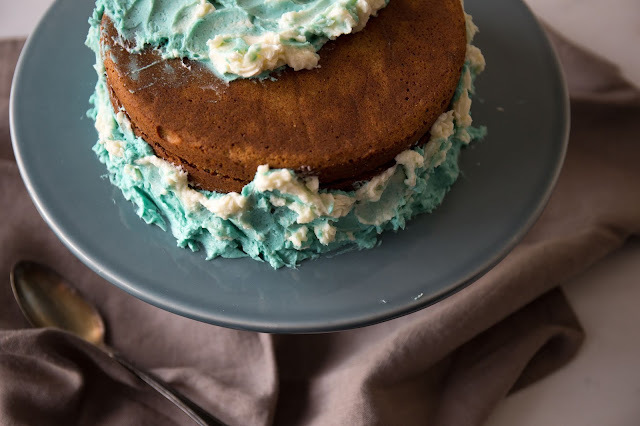 Dye some of the boiled milk frosting grey-blue as desired. 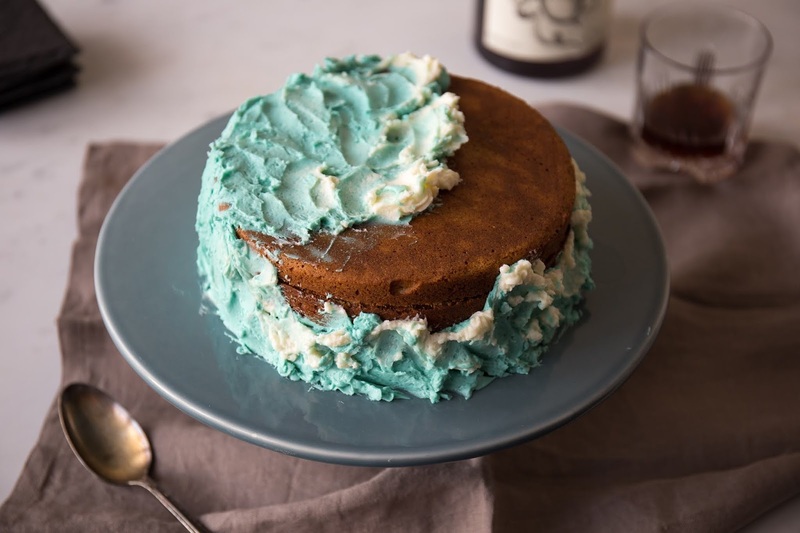 Pipe frosting onto part of the sides and top of the cake and spread using an offset spatula into waves and swirls, alternating blue and white colours as desired. There are no rules here. Sprinkle with extra Maldon or other flaky salt.